If you are investing in either Bitcoin or Gold, it's important to understand which asset is behaving more like a bubble than the other. While it's impossible to understand how the market will value these two very different assets in the future, we can provide some logical analysis that might remove some of the mystery associated with the market price of Bitcoin versus Gold. I've read some analysis on Bitcoin profitability and energy consumption that seemed unreliable, so I thought I would put my two cents in on the subject. In a recent article that was forwarded to me by one of my readers, How Many Barrels Of Oil Are Needed To Mine One Bitcoin, the author used the information in the chart above to calculate the energy cost to produce each Bitcoin. He stated that the average energy cost for each Bitcoin equals 20 barrels of oil equivalent. Unfortunately, that data is grossly overstated. 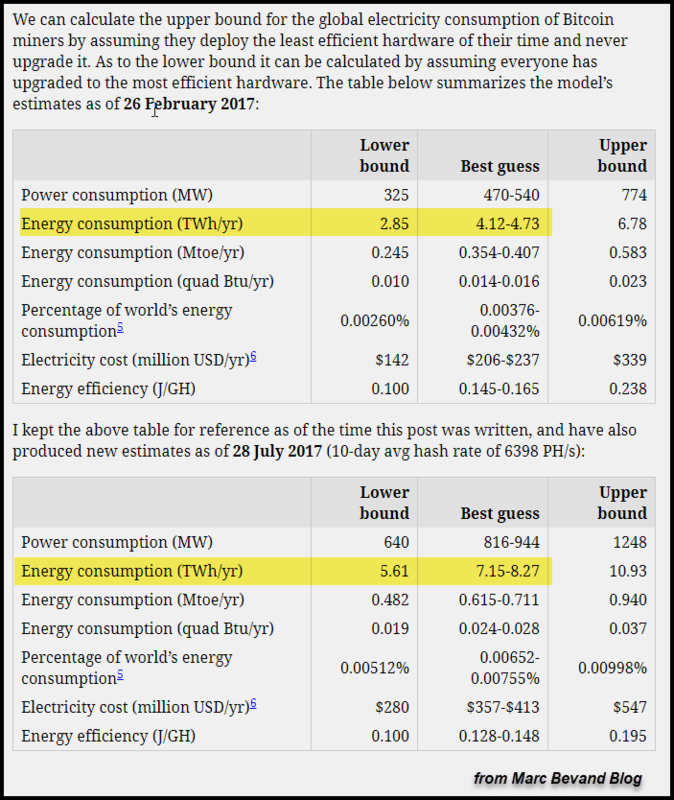 The table above shows the Bitcoin energy consumption analysis on Feb 26th at a Best Guess (average) of 4.12-4.73 TWh/yr. However, Marc updated the data again on July 28th, as the hash rate increased, to show total Bitcoin energy consumption rose to 7.15-8.27 TWh/yr. I took the average of his range to be 7.7 TWh/yr. Nonetheless, I had to update the number once again because it has been three months since Marc calculated his figures. I decided to increase the 7.7 TWh/yr rate by 45% to account for the past three months. I arrived at the 45% figure by using the 75% increase in Marc's energy consumption figures from Feb to July. His energy consumption figures increased approximately 15% per month. Thus, three months equals 45%. 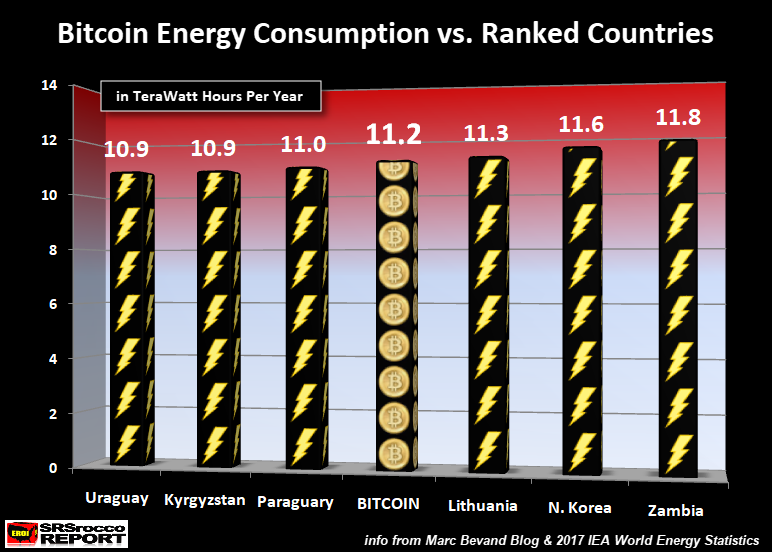 I would recommend those who want to understand the differing opinions on the Bitcoin energy consumption figures by these two analysts to go to the link I provided at Marc's blog. If you go to that page, you will see a long debate between Marc and the Digiconomist on why they disagree. 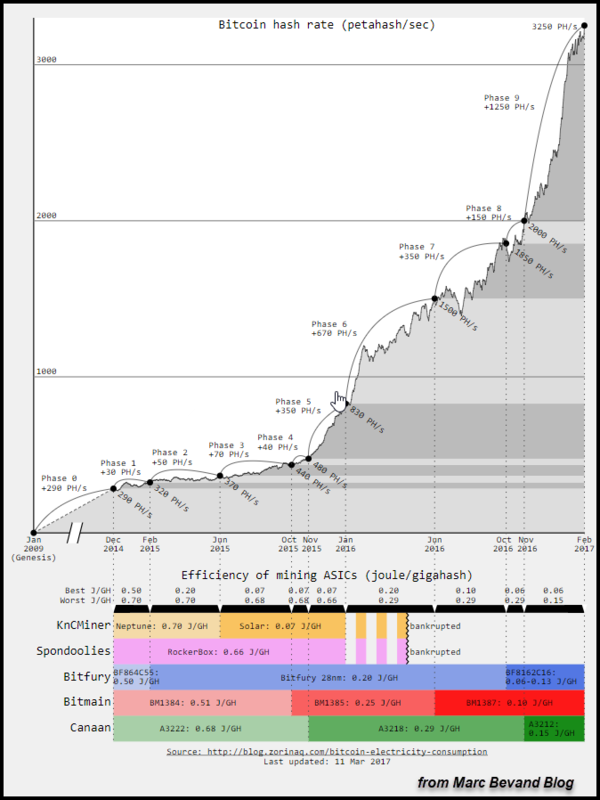 Regardless, I believe Marc Bevand did a much better job at crunching the numbers and details of the Bitcoin Miners and their efficiencies to arrive at a much more accurate figure than the Digiconomist. Either way, Bitcoin does consume one hell of a lot of electricity to produce each digital coin. 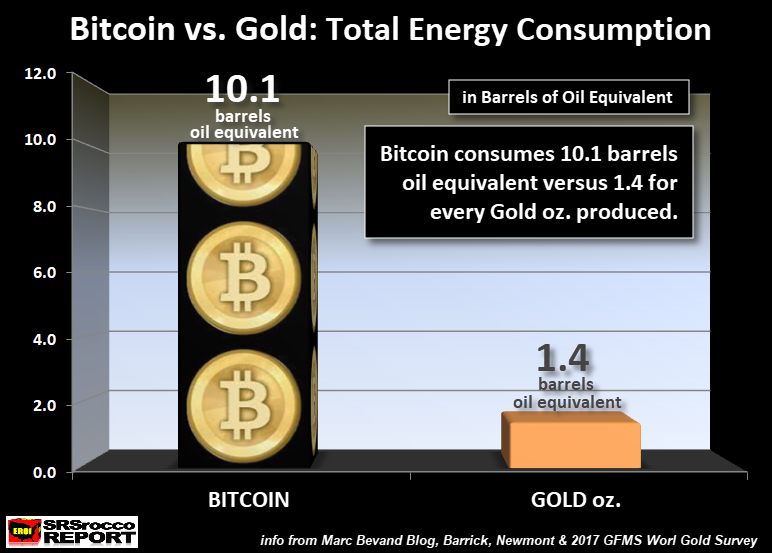 While it only takes 1.4 barrels of oil equivalent to produce an ounce of gold, it takes 10.1 barrels of oil equivalent to produce one Bitcoin. Thus, Bitcoin consumes seven times more energy to produce each digital coin than it does for each gold oz. Even though it takes a lot more energy to produce each Bitcoin, the Gold Mining Industry consumes one hell of a lot more energy overall. If we assume that 85% of total global gold production comes from primary gold mining only, then the 88 million oz (Moz) produced in 2016 consumed the energy value of an estimated 123.2 million barrels of oil equivalent versus 6.6 million barrels of oil equivalent for all Bitcoin production. 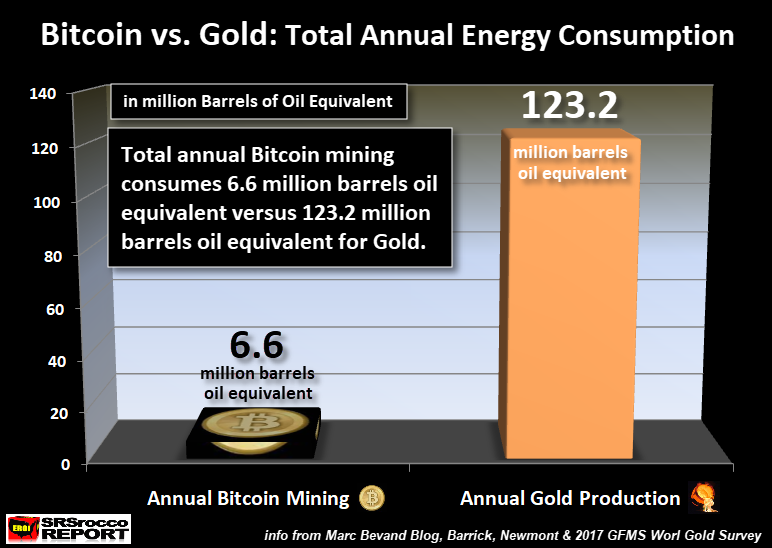 Now, the reason Bitcoin consumes less overall energy than the global primary gold mining industry is due to the much small annual number of Bitcoins produced versus gold. In 2016, the primary gold mining industry produced 88 Moz versus an estimated 650,000 Bitcoins in 2017 (based on data showing 1,800 Bitcoins mined each day). Which means, the primary gold mining industry is currently producing approximately 135 times more gold than the Bitcoin mining industry. While some precious metals analysts have switched over to investing more in Bitcoin (and cryptos) than gold, I don't belong to that group. Unfortunately, these analysts seem to have forgotten about energy and the Falling EROI - Energy Returned On Invested. One of these analysts recently put out a video suggesting that silver only had about ten years to be removed from the shackles of Central Bank manipulation before new high-technology would produce silver for next to nothing. I believe this analyst used the Star Trek replicator as an example. I will be publishing detailed information in the future why I believe Gold and Silver will still be the GO TO ASSETS to own versus Bitcoin and the Cryptocurrencies. Bitcoin vs. Gold: Which One's In A Bubble? Actually, the text above came from Marc as he was replying to my question on his blog. However, this Bitcoin break-even cost is now outdated. 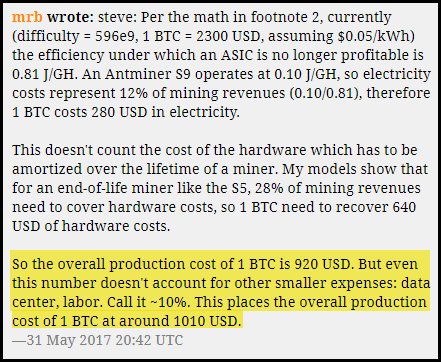 So, I sent Marc an email back at the beginning of August to see what his new estimate for the cost to produce Bitcoin. He replied on August 8th stating his best estimate was about $1,500. By adjusting for the increased cost to produce Bitcoin over the past two months, I came up with a figure of $1,800. Yes, it's a ball-park figure, but it's the best estimate we can go by. 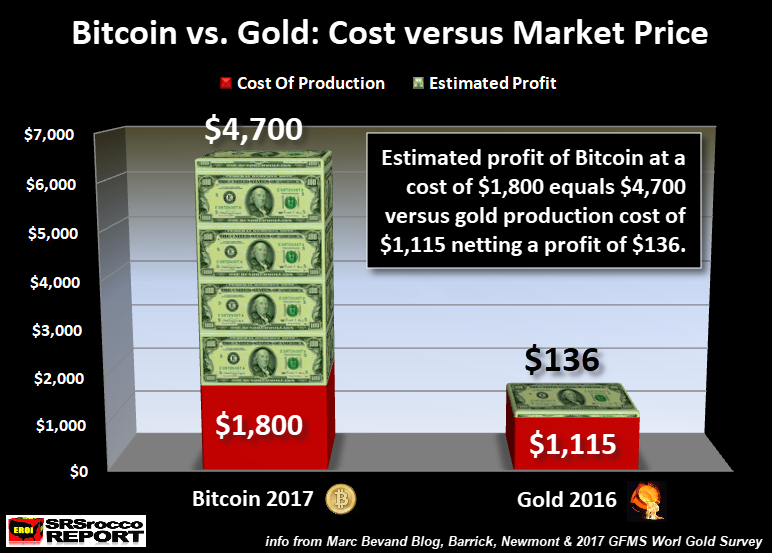 If we compare the estimated profit margin in these two assets, we can clearly see that Bitcoin has a great deal more FROTH than gold. Yes, I realize I took some liberties in providing the Bitcoin production cost, but I believe it's a pretty accurate figure. While other articles have stated that Bitcoin mining is no longer profitable, I disagree. I believe it is exceedingly profitable to produce Bitcoin if you have purchased the most recent mining equipment and have set up the operation in an area that provides low electric utility rates. Alright, I imagine there are some (maybe many.. LOL) that don't agree with my analysis. First, many people in the precious metals industry still do not agree with the overriding factor that determines the price of gold is its cost of production. Second, while supply and demand forces do impact the gold price over the short-term, the cost of production has always been the number one factor over the longer-term. If we go back to the end of 2013, we can see a spike up and then consolidation lower in 2014. The present Bitcoin price spike in 2017 has lasted longer than the one at the end of 2013, but we can clearly see a pattern. Who knows how long Bitcoin will continue higher before it consolidates lower. Some precious metals analysts now turned Bitcoin specialists are suggesting that Bitcoin will reach $13,000 by the first half of 2018. Hell, I don't know if that will happen. Maybe it will; perhaps it won't. I really don't care. I have nothing against Bitcoin. However, Bitcoin needs a very high-tech electronic system to function. On the other hand, any poor slob in the country owning some gold can walk into town and use it as money. Now, when I say, "poor slob," I am using that term in jest. Actually, I am a poor slob just like the next person. Regardless, Bitcoin functions as an electronic asset if the machines keep working. Now, go down to Puerto Rico and see how many people will take Bitcoin. However, if you have cash, gold, and silver... you are ready to do some business. If a person wants to own and speculate in Bitcoin... that's fine. But, it is much more prudent to hold most of one's wealth in physical gold and silver rather than Bitcoin.